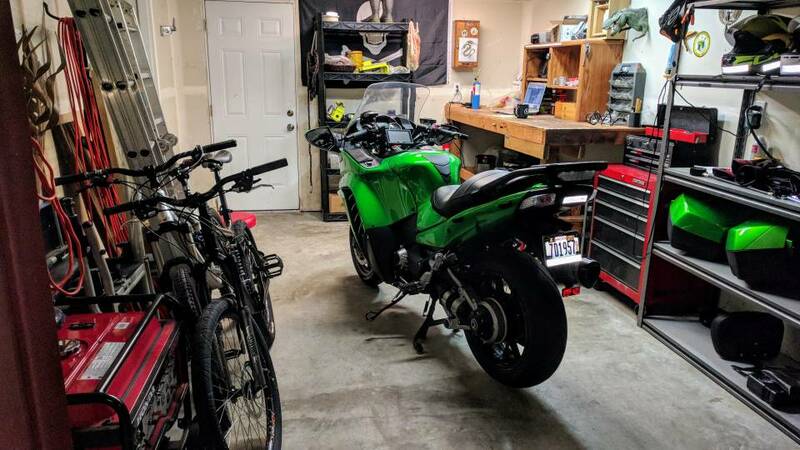 PNW Moto - My garage. This is the " before". Going to do a garage makeover and i need some suggestions. Well for starters that big green thing is taking up way to much room. I'll come haul it away for free. May I suggest Pinterest for ideas? One I'm planning on adding is a recessed bike lift. A Motorcycle dolly that gos under the center-stand, makes it easy to move the bike around, and out of the way. If you have limited space. Hang those bikes up from the ceiling or the wall with some "J" hooks. As some Others said ditch the lower shelf on the workbench get the tool box and genny underneath it And hang the ladder on the wall hang the bikes From the ceiling. But it looks pretty functional as is. I made my garage 2 cars wide and 2 cars deep. I also put in a floor drain and a heater so that I can wash my cars and bikes inside in the winter. With all due respect to Mudslinger, I almost agree with this, until I remembered how many times I’ve scalped myself... I like to keep the bicycles away toward the wall as much as possible. Wall-mount works for me. I say this, but my MTB still hangs from the rafter, but closer to the wall now. I agree. Mine is mounted to the wall with "J" hooks. I was just throwing out different options. (picture is not my place).